I love tuna salad. Canned white tuna, with minced celery and pickle, some mayonnaise and maybe a few capers… if I could eat that as often as I’d like, I’d end up as mad as a hatter (or maybe just as mad as Jeremy Piven) due to the elevated levels of mercury in canned tuna. What’s a tuna-phile to do? Mash 2-3 cups of chickpeas with the tines of a fork. (You could trying using a food processor but one pulse too far and you’ve got hummus instead.) This can be a little tedious but the resulting texture is more appealing. To pass the time, I recommend Pandora’s Oldies Soul station, as pictured above. 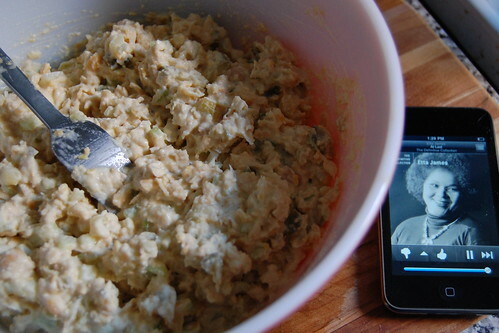 Add minced celery, pickle, mayonnaise, or whatever your mom added to tuna salad when you were a kid. ← Veselka, I love you; ya tebe lyublyu, Veselka. I think I will try this! I don’t eat seafood, but I do love chickpeas and pickles (haven’t tried them together before, though).